PICPA theme for this year - “SHINE” will never be complete without proactive service to our community. We have been blessed with favor and abundance by our Almighty for all our hard works and endeavor throughout the year. Now, it’s time to share these providence. Every year, the Professional Regulation Commission (PRC) visits the Middle East to conduct a Special Professional Licensure Examination (SPLBE) for various disciplines - Nurses, Architects, Teachers, Engineers, among others. On September 1, 2 & 3, 2017, the PRC and Professional Regulatory Board of Accountancy administered the SPLE 2017 for Certified Public Accountants (CPA) in the following locations: Al-Khobar, KSA; Jeddah, KSA; Riyadh, KSA; Doha, Qatar; Abu Dhabi, United Arab Emirates; Al Ahmadi, Kuwait; Muscat, Oman; and Tel Aviv, Israel. For 2017, a total of 168 hopeful candidate took the examinations. The results were released on the evening of November 2, 2017. 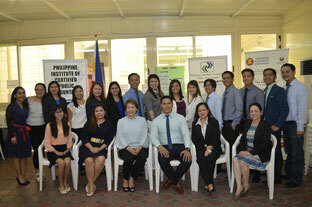 Result revealed 38 successful passers were added to the roster of Filipino Accounting Professionals. PICPA Abu Dhabi Chapter welcomed six (6) of their associates as full-pledged members during the oath taking ceremony which was held on November 29, 2017 at the halls of Royal Rose Hotel in Abu Dhabi, UAE namely: Georgette Bartolome Abcede, Karen Torres Arcilla, Johnny Rey Gumapang Caldoza, Rocsan Macua Cuarez, Maria Cenisa Belardo Paterno and Loida Haydee Turno Reyes. Present in the event as guests of honor were Vice Consul Rowena Daquipil Third Secretary and Vice Consul Head Atty. Anna Marie Guera. Vice Consul Daquipil who led the oathtaking of the new CPAs and shared inspiring message and updates on the Philippine Embassy’s activities. Also present were the present and past PICPA officers, members and invited guests and families of the passers and the new aspirants for the upcoming SPLE 2018. Each passer had their moment on the spotlight where they shared the struggles of their journey on becoming CPA and finally celebrated their victory. The night was indeed a joyous one where everybody shared laughter and tears while listening to the speeches. The event was capped with picture taking. 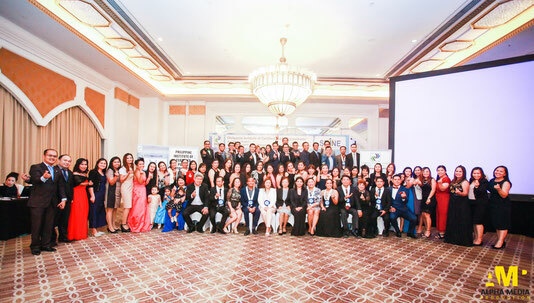 Philippine Institute of Certified Public Accountants Abu Dhabi chapter celebrated 15 years of uninterrupted service to its’ members and associates and the Filipino Community in Abu Dhabi on 22 September 2017, at the Sheraton Hotel. Officers, members, associates, past PICPA Abu Dhabi presidents attended the celebration. The highlight of the event was the speech of Ms. Dorotea Rafael,CPA the founding president of PICPA Abu Dhabi. She reminisced the early days of PICPA Abu Dhabi and told the story of how it all began. It was 2003 when a group of Filipino Accountants and Finance professionals initiated the organization of the PICPA Abu Dhabi chapter. Ms. Rafael along with other Filipino Certified Public Accountants thought Filipino Accountants and Finance Professionals needed an organization that would represent the ideals of PICPA National in Abu Dhabi. The 14 past PICPA presidents were also recognized that night for their valuable contribution and untiring support to the PICPA Abu Dhabi organization. Mr. Iyad Mourtada, CFE, CIA, CMA, CCSA, CRMA, CPLP, CSX, M.A, an international speaker, trainer and author also conducted a technical session dubbed as “Fraud-o-logy: The art of fraud and the science behind uncovering it.” during the event. Hon. Constancio Vingno, Philippine Ambassador to the United Arab Emirates, together with his wife, Madame Mrs. Yoko Ramos-Vingno, Vice Consul Rowena Daquipil and Vice-Consul Anna Guerra also graced the event. Hon. Vingno congratulated and inspired the PICPA Abu Dhabi Chapter for its 15th anniversary. Further, Vice Consul Daquipil administered the oathtaking and induction of PICPA Abu Dhabi officers 2017-2018. PICPA Abu Dhabi members and associates were also inducted by Mr. Silveriano Prieto, Jr., President, 2017-2018. For the past 15 years, PICPA Abu Dhabi has conducted hundreds of seminars and trainings like Bookkeeping and Accounting For Non-Accountants, Financial Literacy, Letter of Credit and Bank Guarantees, MS Excel and many others for very low fees – mostly just to cover the costs of the event. This year, PICPA Abu Dhabi was the sole host for 8th PICPA Middle East Conference. Also, PICPA Abu Dhabi conducts a sport-for-a-cause events for which proceeds are given to the distressed OFWs in Abu Dhabi. The flagship program of PICPA Abu Dhabi is the PICPA Tutorial Group which has already produced 43 CPAs as of 2016 SPLE exams. 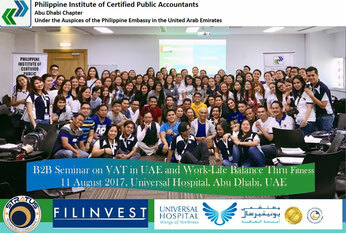 To prepare themselves for the new Value Added Tax Law to be implemented in the UAE starting January 2018, more than 130 Filipino Accountants and Finance Professionals attended the VAT seminar hosted by the Philippine Institute of Certified Public Accountants (PICPA) Abu Dhabi Chapter on 11th August 2017 at the Universal Hospital, Abu Dhabi. Mr. Arnel Gagani, CPA, Manager of Alliot Hadi Shahid Chartered Accountants who has over 20 years of experience in audit, consultancy and VAT was the speaker. The first half of his talk focused on the definition, history and characteristics of VAT. He also highlighted the salient features of GCC VAT Agreement and the possible effects of VAT on different industries. Mr. Gagani also gave the participants an overview of UAE’s Federal Law No. 7 of 2017 also known as the Tax Procedures Law issued on 16 Ramadan 143H (11 June 2017). The attendees coming from different companies with different industries in the UAE, actively participated in the quizzes on sample basic VAT computation. They believe that VAT implementation in the UAE would open more opportunities especially to those who have experience in accounting of VAT in the past. Also, the attendees were grateful to PICPA Abu Dhabi for hosting a very timely and relevant seminar considering VAT’s implementation in less than five months. Due to overwhelming turnout of the event, PICPA Abu Dhabi plans to conduct the same seminar to cater more Filipinos who wish to equip themselves of the upcoming VAT implementation. Further, PICPA Abu Dhabi would also organize more in depth VAT workshop in the next few months. For the first time in the history of PICPA Abu Dhabi, Filipino Accountants and Finance Professionals shifted their focus from the usual numbers, financial analysis, audit, and other finance/accounts related topics to tackle about health and fitness on 11th August 2017 during the “Work-life Balance Thru Fitness” activities at the Universal Hospital, Abu Dhabi. Over 100 participants stretched their muscles and dripped their sweats as Mr. Enrique Aligato, CPA, CISA, Fitness Instructor at Lesmills Elite, led them in various physical activities including squats, push-ups, planks, among others. Mr. Aligato, who is also an internal Audit Manager by profession, shared to the participants the importance of at least 90-minute work-out per week to maintain a fit body. During the event, three doctors from Universal Hospital also gave talk on health awareness. Dr. Lally Alexander, a neurologist, emphasized how stress could affect the brain. Thus, she shared the importance of a positive outlook for a healthy brain. Further, Dr. Anna Marie Diaz, a general practitioner discussed the lifestyle diseases which are primarily based on the daily habits and results of relationship of people. These habits include smoking, unhealthy diet, physical inactivity that affects not only adults but also children. Finally, Dr. Elizabeth George, a dermatologist shared the common cosmetic problems and how to deal with them. In summary, the event highlighted the importance of healthy habits, healthy diet, physical activities, positive outlook and regular screening for a fit and healthy body. After all, “Health is wealth”. PICPA Abu Dhabi Tutorial Group (PTG) is indeed excited for the upcoming Special Philippine Licensure Exam for Certified Public Account...ants (SPLE – CPA) on 1-3 September 2017 here in Abu Dhabi, UAE not only for the result but also to assess how well they have prepared the examinees for this unforgettable exam. Admittedly, the CPA exam is one of the toughest licensure exams in the Philippines. This endeavor requires dedication, discipline, perseverance and retention. Aside from self-preparation our examinees needed solid support system and prayers from their family, friends and those who’ve succeeded the exam before them. Gladly, even away from home, PICPA Abu Dhabi Family showed their overwhelming support to our examinees under PTG lead by the Director of Education Mr. Johann Salangsang, CPA. This year’s new batch of examinees kicked off their preparation last November 2016 to make sure that all in the CPA Exam Syllabus will be covered and it was indeed delivered. 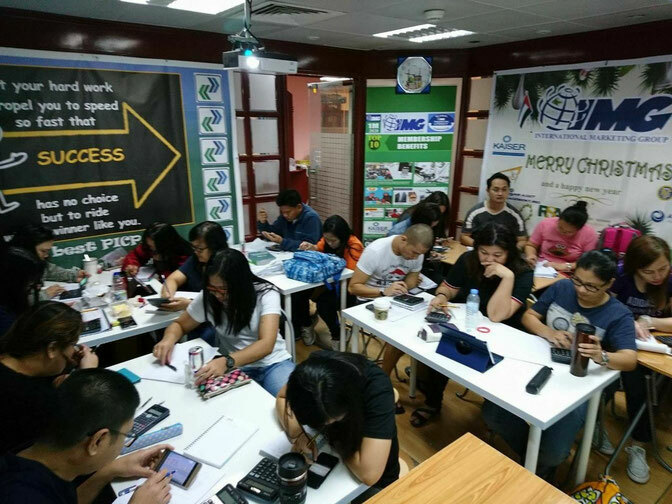 They held their review at IMG Office, Landmak Bldg, Hamdan Street with the help of some PICPANs who voluntarily gave their service and shared their knowledge, experiences and some tips to pass the CPA Exam. As part of their preparation, they tested the readiness of the aspirants through series of mock board examinations in the month of January, April, July and August. How did you manage your time and review? What are the challenges have you encountered during the review and how did you overcome them? How did PTG help you in your preparation for CPA Exam? The preparation may be so long and tiring but your effort will surely be paid off, PTG aspirants. It will all be worth it. With all the learning and discipline one has developed by this undertaking, we the Filipino Accountants in UAE will SHINE to the World. Thanks to PTG through PICPA Abu Dhabi for doing an amazing advocacy of helping some Filipino Accountants to make CPA aspirants dream come true. God bless to all aspirants not just for CPA exam takers but for all disciplines who will participate in 2017 SPLE. We are praying for your SUCCESS. A new batch of dedicated officers of the Philippine Institute of Certified Public Accountant in Abu Dhabi held their induction and oath taking ceremony last 28 July 2017 at the Philippine Embassy, United Arab Emirates. Atty. Anna Marie Guerra, Third Secretary and Vice Consul Head, Assistance to Nationals Section of the Philippine Embassy, UAE administered the ceremony. 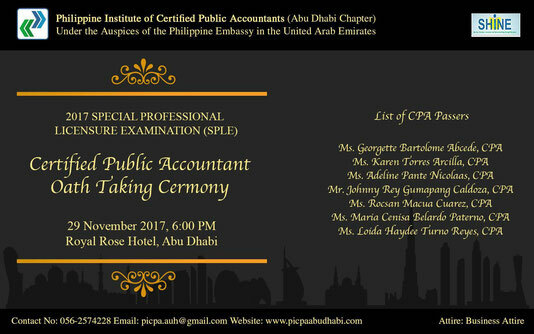 The PICPA Abu Dhabi chapter led by the incumbent President Silveriano Prieto, Jr., CPA is composed of 37 set of officers. These consist of old and new breeds set to train in order to keep the leadership wheel going. During the ceremony, Vice Consul Guerra extends her warm congratulations to the new set of officers. Further, she thanks PICPA Abu Dhabi for their support to the works of the Philippine Embassy and wishes for more partnership between the embassy and the organization. Service Honesty Innovation Nation Building through Education (SHINE). Using this year’s PICPA National theme, over 25 PICPA Abu Dhabi 2017-2018 officers (Officers) attended the team building activity held at the Adagio Hotel Apartment on 20-21 July 2017. The two-day activity encourages the newly elected officers to build camaraderie among each other and discuss leadership strategies to achieve the goals of PICPA Abu Dhabi for the year. The Officers were elected during the PICPA general assembly held last June 2017. 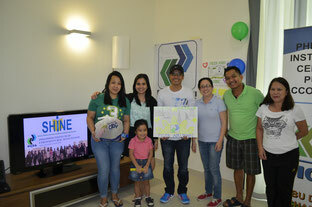 During the event, the participants were divided into three groups – Red-Service, Blue-Honesty and Green-Innovation. PICPA Abu Dhabi past presidents, Marybeth Junio, CPA and Williard Maquirang, CPA facilitated the event which kicked off on Thursday night with a cheer/chant from each team. The getting-to-know each other game followed discussing the Officers’ view on random things which include questions like “Who motivates you to succeed?”, “Which do you prefer: Jack of many trades or Master of One?”, “What animal best describes you?”, etc. The highlight of the event was the presentation where each teams expressed their thoughts on this year’s PICPA theme, “SHINE”. Mr. Aladdin Masayon, CPA, Assistant Director for Public and Press Relations stressed the importance of Service the accountants provide, not only to the company we are working with, but towards our social responsibility, in general. Ms. Sharina de Dios, CPA, Vice President, emphasized how CPAs should deal with honesty and integrity in all aspects of our lives, especially at work. Mr. Johann Salangsang, CPA, Director for Education, discussed the innovation as key to becoming a greater version of ourselves and of PICPA Abu Dhabi. Meanwhile, Mr. Maquirang conveyed his thoughts on leadership. The Officers also participated in various games such as Kahoot.it, marshmallow tower, puzzles, relay, poster making and most-liked photo on Facebook. 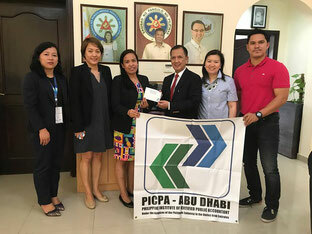 The Philippine Institute of Certified Public Accountants (PICPA) in Abu Dhabi, represented by the incoming and outgoing Presidents, Mr. Silveriano Prieto, Jr., CPA and Ms. Marybeth Junio, CPA, respectively, on Thursday, 7th July, turned over some amount of cash to the Philippine Embassy in the UAE headed by Hon. Ambassador Constancio Vingno, Jr. for the benefit of the distressed Overseas Filipino Workers (OFW) in the wards of the Embassy Shelter. The cash handed over were from the proceeds of the “Strike-for-a-Cause” Bowling Tournament organized by the PICPA Abu Dhabi in collaboration with AUH Dabarkads and Abu Dhabi Bowlers Group, headed by Jojo Mercado and Shean Aguas, respectively. The tournament, which was attended by various bowlers and non-bowlers from PICPA members and the bowler groups, was held on 10th March 2017 at Zayed Sports City, Abu Dhabi. Every year, PICPA Abu Dhabi organizes sports tournament to raise some amounts for the same cause. In the previous years, PICPA Abu Dhabi had donated air tickets, luggage, toiletries, among others to aid the said OFWs. This year, PICPA Abu Dhabi’s Director for Events and Sports, Ms. Gretta Astudillo, CPA plans of another “Sports-for-a-Cause” tournament which is set to happen in the last quarter of 2017. Further updates will be posted in PICPA Abu Dhabi’s official Facebook page.